Operators: Sevastjyanov V.I., Nikolaev A.G.
Reel №1 424 hours over the planet. The launch of the Soyuz-9 spacecraft. 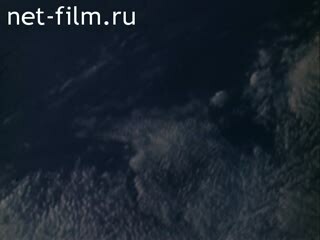 Newsreel, shot on board the spacecraft: a view of outer space from the porthole. Astronaut VI Sevastyanov aboard a spaceship. Nikolaev is selected from the sleeping bag. Sevastyanov cleans his teeth with a special napkin, wipes his face. Astronauts make a morning toilet, shave in conditions of weightlessness with various razors. Nikolaev puts on a tracksuit. Astronauts are discussing the flight program for the upcoming day. Nikolaev and Sevastyanov check the systems and instruments of the descent vehicle. Nikolaev switches the toggle switches on the dashboard. Conducting medical research aboard a spaceship. A view of a part of the Earth from space. The crew is preparing for breakfast. Sevastyanov warms the tuba with coffee. Nikolaev opens a special can of canned food. Sevastyanov is filming through the porthole, views of parts of the earth's surface. Nikolaev conducts research on the reactions of the visual apparatus in space. The cosmonauts perform special gymnastic exercises in the space compartment of the spaceship. Sevastyanov and Nikolaev conduct technical experiments and tests of new devices, include and orient the control system of the ship. The appearance of a part of the earth's surface from the ship's porthole during the rotation. Astronauts are taking photographs of the given area of ​​the Earth. Conducting a combination of the sighting with the gyrocompass of the ship, the operation of the instruments. Sevastyanov works with the space sextant, Nikolaev records the measurement data. 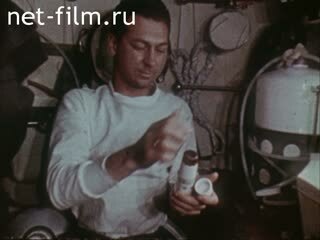 Newsreel, filmed in space: the crew of the spacecraft starts dinner, heating the tube with soup. Sevastyanov and Nikolaev have lunch. Sevastyanov is preparing a camera for the next survey, is surveying the earth's surface, replacing the lens in zero-gravity conditions. Nikolaev and Sevastyanov in the cockpit of the spaceship. Sevastyanov is preparing for a television report from the domestic compartment of the ship. The shooting of the compartment by a portable space camera, the panorama of the compartment. Sevastyanov with a television camera in his hands. 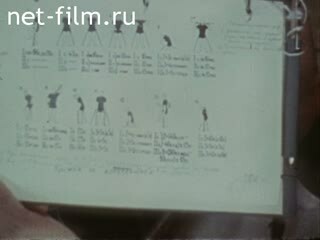 Nikolaev makes notes in the logbook. Stacking of research equipment at the end of the cosmonauts' working day. The astronauts go to sleep in sleeping bags. Episodes of the daily work of astronauts, a view from the ship's porthole. The faces of the astronauts. Page view of the logbook. Kinds of the Earth from space.